Mario Botta describes his mountainous architecture as influenced by “two points of interaction: the exterior with the landscape; the interior with the domestic.”2 In this study I examine how his design of two churches in Ticino, Switzerland addresses the dissonance between the stoic exterior of the mountains and the touch of human scale inviting worshipers to solitude. I analyze Botta’s mountainous churches of the Chapel of St. Mary of the Angels, built in Monte Tamaro, 1990-1996 (Fig. 1) and the San Giovanni Battista Church, built in Mogno, 1992-1998 (Fig. 2). The two churches exemplify the challenges of designing a house of worship for small parishes within breathtaking nature. The first challenge addresses the design solutions in the context of remote areas in the Alps. These locations evoke in themselves a spiritual experience, and the issue is how architecture contributes to the desired spiritual solitude. Second, both buildings were built from local stones linking them to their specific sites, expressing monumental qualities, and adhering to the spiritual qualities of the space: “Although the landscape is immense, the insertion of even a small object changes the scenery.”3 This solution brings with it the idea of architecture transforming the landscape, which in turn stimulates the spirit of man. Third, in each of the churches light is treated to enhance spiritual transcendence and to illustrate divine presence. Furthermore, these churches may be perceived as part of the continuous attempt of humans to build pillars from stone as a sacred link between earth and heaven, and as an expression of possessing the mountain. Mountains are perceived as God’s dwelling and as a spot where the sacred manifests itself: “Now Mount Sinai was altogether in smoke, because the LORD descended upon it in fire; and the smoke thereof ascended as the smoke of a furnace, and the whole mount quaked greatly” (Exodus 19:18). Moreover, the echoes of the surrounding mountains are perceived as the voices of spirits.4 These spiritual experiences inspire humans to erect their own ‘sacred mountains’. See for example the story of Jacob who set the stone up as a pillar and poured oil on its top to establish a sacred vertical axis (Genesis 28:18). These sacred structures often imitate in stone the form of mountains or are built on top of a mountain. The chapel in Monte Tamaro is constructed from reinforced concrete faced with rusticated porphyry (Fig. 1). This stone façade makes the chapel blend into the rocks of the mountain and transforms the mountain’s peak into a new height. Botta introduces us to a temporal visual experience with an outdoor procession on top of the chapel/the mountain. 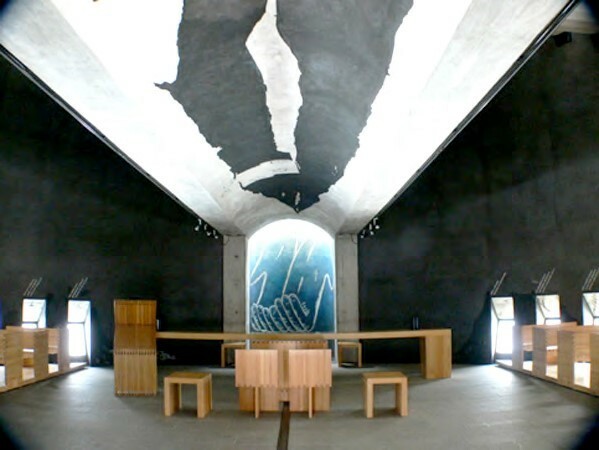 The stone of this chapel is facing the exterior only; the interior concrete is painted black and white to enhance the interplay of light and shadow and to create an intimate place to showcase contemporary liturgical art (Fig. 3). Plastering the walls for displaying art resembles the fresco chapels in history. ​In contrast the church in Mogno is built of alternating courses of gray Riveo granite and white Peccia marble outside and inside, reminding us of some of Tuscan Romanesque cathedrals (Fig. 4). As such it continues a long history of church construction and creates a statement of permanence. The stone in this church demonstrates Botta’s mass architecture and enhances the transformation of the geometry of the building from a square plan to ellipse and then to a circle. Interestingly Botta treated this relation of light to the cosmos differently in the two churches. The chapel at Monte Tamaro, which is located below the outdoor crucifix, under the walkway on top of the mountain, is dimly lit like a grotto. Natural light penetrates through very small windows in the bottom of the circular sidewalls and through slits from a skylight. This light effect and the space’s strong linear path draw our attention to the artwork at the apes (Fig. 3) and diminish the invitation for meditation inside a protective ‘cave’ in the mountains. In the Mogno church Botta introduced the ever-changing patterns of light and the relation to the cosmos through a circular glass roof (Fig. 4). The sky opens up beyond the glass roof and brings the worshiper closer to the Divine. Two granite buttresses pierce the envelope of the building, arch over the interior and create an axis that aligns with the nave’s axis of the destroyed historic church. The light coming from above highlights this connection to the past and eternity. It also demonstrates Botta’s transformational geometry in stone. This in turn creates an interplay of stone layout, natural light and shadows (Fig. 4). In this church Botta used light to capture the passage of time and establish our relationship with the solar, seasonal cycles and the eternal. From my visits to the two churches and the literature review of his work, it seems to me that Mario Botta was not consistent in solving the dissonance between the majestic landscape of the mountains and his church architecture. His design of the exterior of the Monte Tamaro chapel stems from the surrounding mountains and is thoroughly site specific. This design is grand as the mountains and follows Botta's claim that the landscape dictates his architectural solutions. However, the design of the chapel’s interior is alienated from the specific place and has more relation to the art display than to the site. While the chapel's exterior evokes spirituality and a feeling of ‘Oh’, the interior seems to be a small art gallery rather than a sacred space. Even though I can see how the liturgical symbols of the artwork by Enzo Cucchi (guided by Padre Pozzi) may lift the human spirit, this artwork does not necessarily transcend the interior space. Although the church in Mogno serves as the focal point of the village and resembles some lines of the background mountains, the building does not seem to rise from the earth and represent the site specifics. Indeed, the cylinder bulky design became Botta's unique style, which he used in other projects in different locations. However, this church’s interior is the powerful part of the design. The work of stone, the temporal changes of light that fall on the stone, the transformation of the shape, the size and proportion, and the link to the sky – all create a sacred permanent space that anchors the church to its place. The space becomes a shelter for spiritual meditation, uplifting the spirit of the worshiper or visitor. It brings them to experience the inner light combined with the outer light that pours into the church through the glass roof. In summary, Botta’s mountainous churches and their details in stone and light illustrate a differentiated design approach to sacred architecture. The experience of spiritual transcendence deriving from the interplay of the sacred building and God’s creation is at times associated with the exterior (the Chapel at Monte Tamaro) and at times with the interior (the church in Mogno). 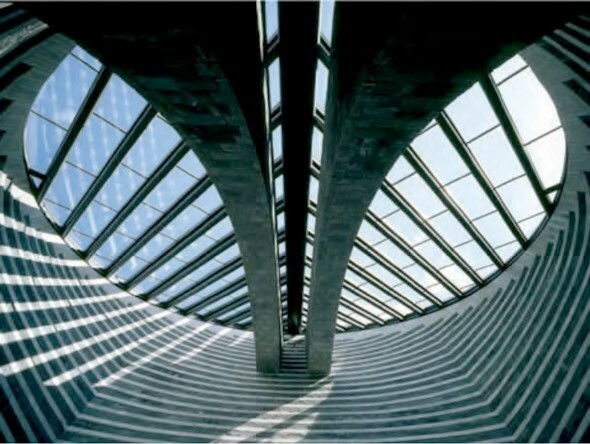 Interview with Mario Botta by Dupre, Judith (2001) in her book Churches. Trans. New York, Harper Collins; pp. 8-12. Hale, Elizabeth (2007) Sacred Space, Sacred Sound. Wheaton, Illinois: Theosophical Publishing House. You can reach the chapel located 5141 feet above sea level by cable car or by a one and a half hour journey on foot. Interview with Mario Botta by Dupre, Judith (2001), p12. In Catholicism the need for a permanent sacred building allows only stone houses of worship to be consecrated by the higher levels of clergy. Tabb, Phillip (2007) ‘Semantic Cosmologies of Ronchamp and Rothko Chapel’ in Eynaten, K. C., Hutchins Kate, and Don Quaintance (eds.) Not Seen: Search for Understanding: The Rothko Chapel Art Series. Houston, TX: A Rothko Chapel Book, pp. 89-99. Wright, Frank Lloyd (1928) ‘In the Cause of Architecture III: The Meaning of Materials - Stone’, Architectural Record 63, no.4 (April 1928): 350-356. Botta Mario (2005) Architetture del sacro: prayers in stone. Bologna : Compositori. p.191. Eliade, Mircea (1958/1996) Patterns in Comparative Religion, New York, NY: Sheed and Ward Inc. 1996 edition published by University of Nebraska Press, Lincoln, Nebraska. Geva, Anat (2011) Frank Lloyd Wright’s Sacred Architecture: Faith, Form, and Building Technology. London: Routledge. Geva, Anat (2009) “Light and Darkness in Sacred Settings.” 2A – Architecture and Art Magazine. Autumn 2009 Quarterly 12: 56-59. Mario Botta (2003) in Gabriele Cappellato (ed.) Mario Botta: Light and Gravity, Architecture 1993-2003. Munich, Germany: Prestel.